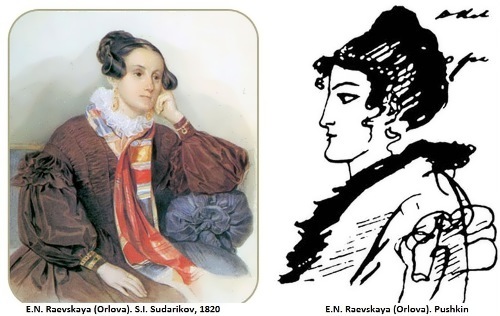 There were a lot of women in Pushkin’s life. He was a real Russian Don Juan. 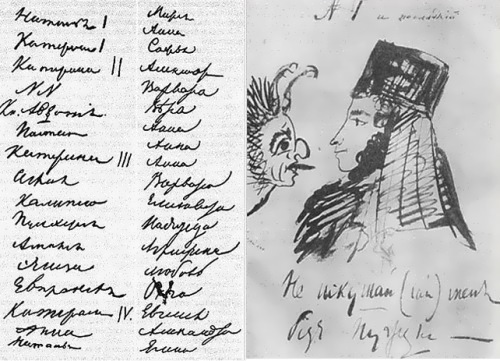 In 1829 Pushkin made two lists of his women in chronological order in Elizabeth Ushakova’s album. First, lists of all the women that he was interested in, were published in 1887 in Pushkin Exhibition Album 1880. There were names written in two columns. 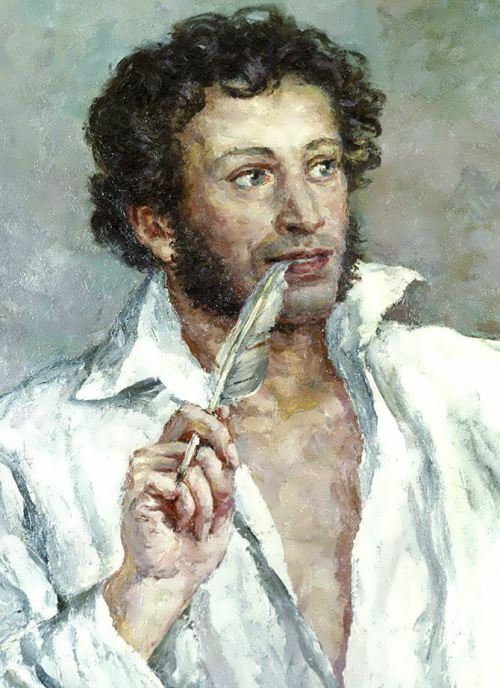 According to Veresaeva in the first part of the list there were names of women whom Pushkin loved and in the second – women whom he was infatuated with. Widely known, that Natalia Goncharova was his “one hundred and thirteenth” love. But those lists were far from complete. There are several transcripts of the names from the lists. 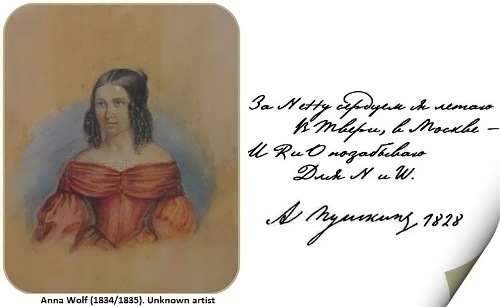 Natalia I – probably theater actress (poems To Natalia, Message to the young actress) or Natalia Kotchoubey (1800-1855), whom he devoted his poem Intoxicated By Memories. According to another version – Natalia Apraksina (Golitsyna). 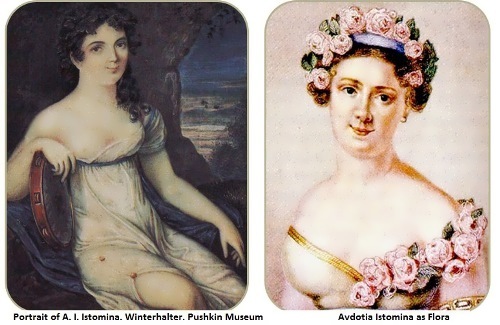 Katerina I – Ekaterina Pavlovna Bakunina (1795-1869), the sister of Pushkin’s lyceum fellow, the object of his unrequited love, maid of honor, artist. She was recipient of poems: To the Painter, So I was Happy, Tears, Window, Autumn Morning, Separation, To Bakunina and others. 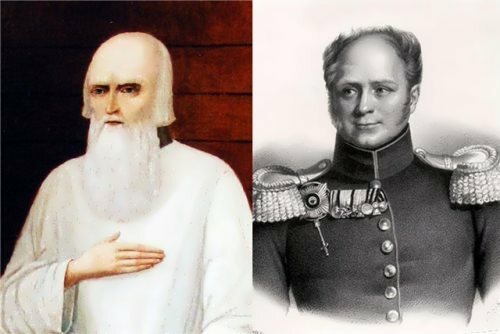 In 1834 Bakunina married Poltoratsky. Katerina II – probably Ekaterina Andreevna Karamzina – wife of historian Karamzin, Viazemskiy’s sister. At first Pushkin courted her, but they became friends. NN – secret Pushkin’s love, whom he met in the south. NN is usually associated with the poem The Fountain of Bakhchisarai and a number of poems. 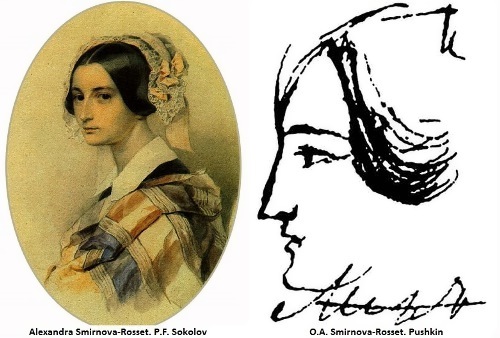 According to different versions, his “secret love” could be Maria Raevskaya (later Duchess Volkonskaya, Decembrist wife), Elizabeth Vorontsova and many others. There was also a point of view that the legend about secret love was a fiction. Pr. Avdotia – Evdokia Ivanovna Izmailova (married Golitsyna, 1817-1818), known as the Princess Nocturne. Pushkin dedicated poems Simple Pupil of Nature and Inexperienced Amateur of Foreign Lands to her. Nastasia – maybe she was a ticket collector at the zoo. On November 12, 1819 Turgenev wrote to Viazemskiy: “He (Pushkin) fell in love with a ticket collector and became her cavalier servant”. Katerina III – probably Ekaterina Raevskaya (1797-1885), married name Orlova. According to another version – the actress Ekaterina Semenova. 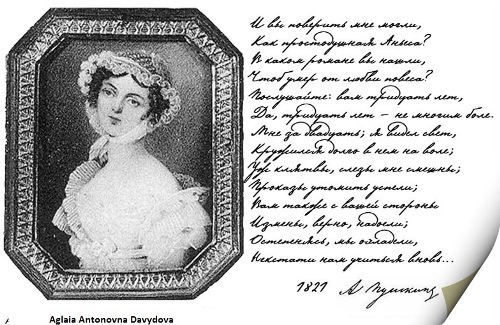 Aglaia – Aglaia Antonovna Davydova, born Duchesse de Grammont. Her first husband was Davydov and the second was Marshal Sebastiani. 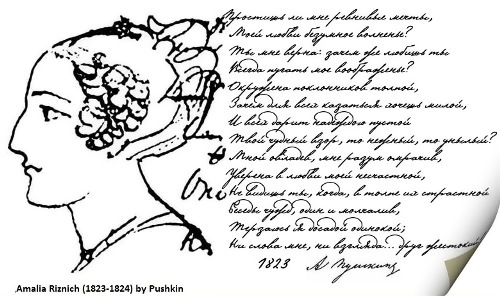 Pushkin devoted poem Coquette to her and wrote an epigram: “Another had my Aglaia”, “A son amant Egl sans rsistance”. 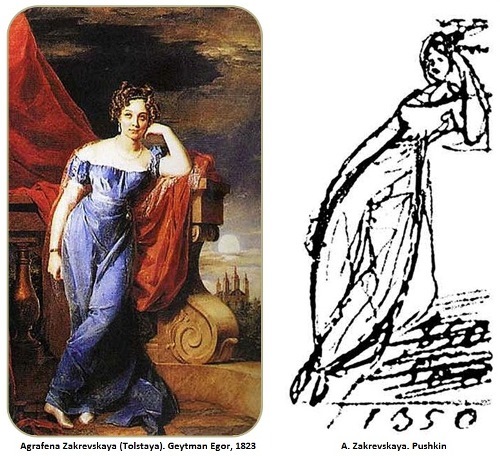 Calypso – Calypso Polychroni – Greek woman, who in 1812 fled from Constantinople to Chisinau, where Pushkin met her. They say she was Byron’s beloved and spoke only Romanian and Greek. 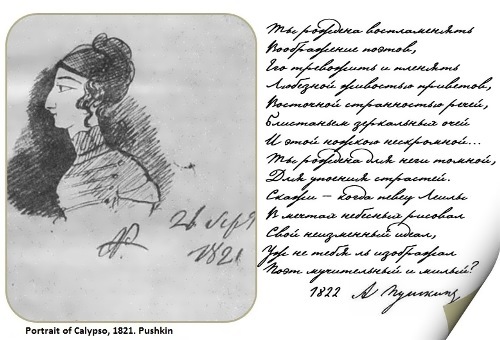 Pushkin devoted to her poem The Greek and probably Stranger and drawing Portrait of Calypso (1821). 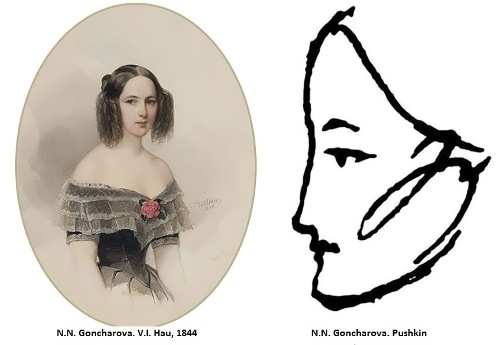 Pulcheria – Pulcheria Egorovna Bartholomew (1802-1863), the daughter of a wealthy Chisinau “baron”, beautiful, cool girl. The poem If a Delicate Beauty was devoted to her. 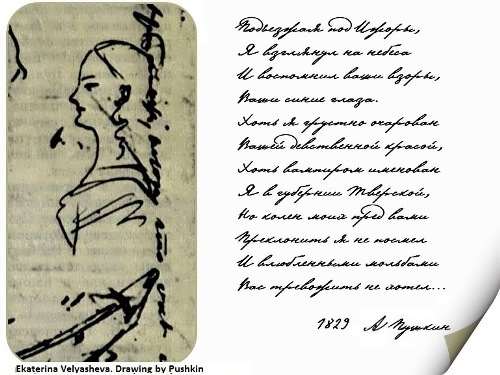 Pushkin wrote about her in a letter to Weigel (from November 1823). Amalia – Amalia Riznich (1803-1825), born Rippa, half German – half Italian, daughter of Viennese banker, the wife of a wealthy merchant in Trieste. Since the spring of 1823 she along with her husband lived in Odessa and in May 1824 the girl went to Italy as she fell ill with tuberculosis. 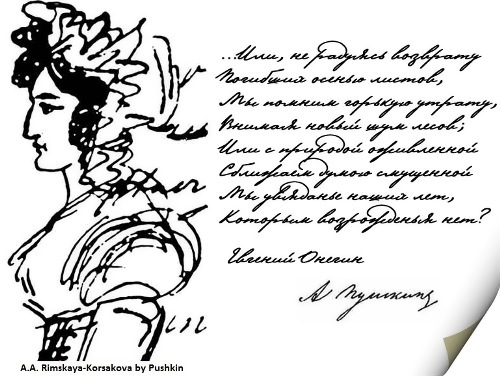 Pushkin was in love with her, and all his poems, associated with her, talk about jealousy: Forgive My Jealous Dream, XV and XVI verse of the sixth chapter of Eugene Onegin (Pushkin didn’t include them in the printed text). After learning about her death, Pushkin wrote the elegy Under The Blue Sky Of The Native Country. 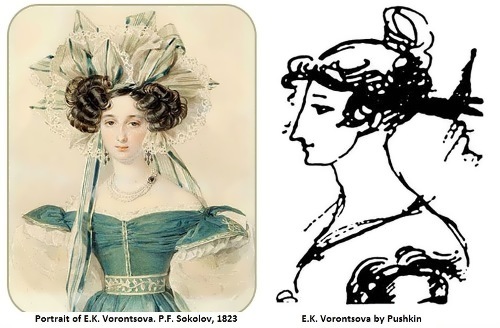 Eliza – Elizabeth Vorontsova (1792-1880), born Branickaya, wife of the Governor-General of Novorossiysk Vorontsov, who exiled Pushkin from Odessa in 1824. The main reason for the expulsion was probably jealousy. Poems Angel, Burnt Letter, The Desire Of Glory, There Is No Connection Between Us and maybe Talisman, Keep Me My Talisman were linked with her name. 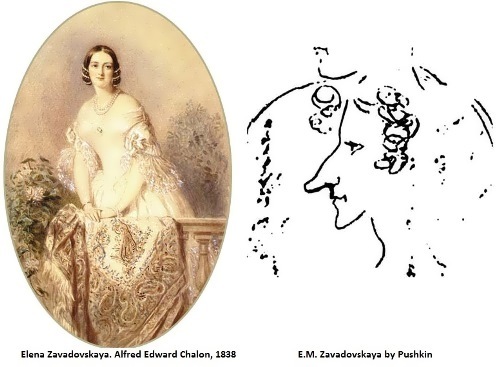 According to another version, she was Elizaveta Hitrovo; only she was called Eliza, Lisa in Pushkin’s letters. 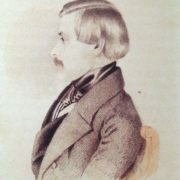 Evprakseya – Evpraksiya Wolf (1809-1883), married name Vrevskaya. He wrote poems If Life Deceive You and Here, Zina, Some Advice. Named Zizi she was mentioned in the XXXII verse of the fifth chapter of Eugene Onegin. Katerina IV – probably Katerina Karamzina (1809-1867), married name Meshcherskaya, daughter of historian and meaningful in this list Katerina I. 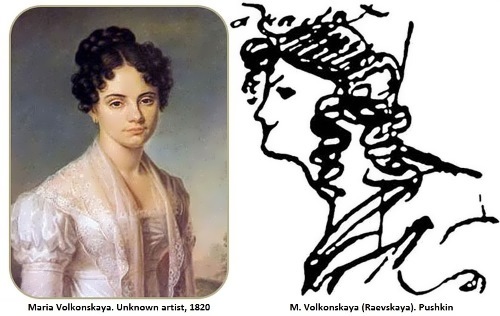 But it is possible that under Katerina IV must be understood not Karamzina, but Ekaterina Velyasheva (1812-1865), married name Gendre. Pushkin met her in January 1829 in Staritsa. Anna – most likely Anna Olenina (1808-1888), married name Andro, the maid of honor. In 1829 Pushkin wanted to marry her, but she refused. She was dedicated poems You and You, Premonition, Her Eyes, I Loved You, he mentioned her in his poem To Dawe, Ecqr. 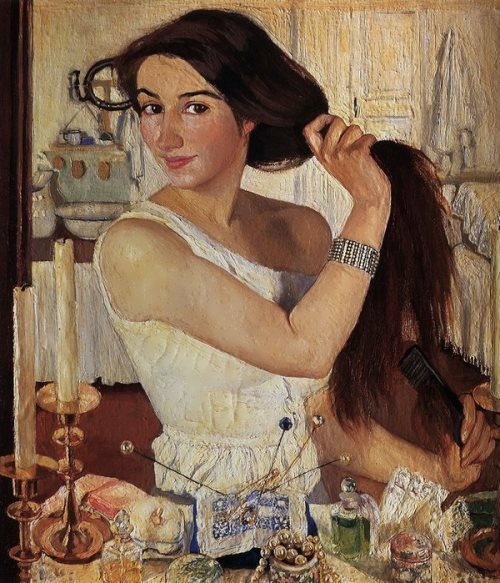 Natalia – of course, Natalia Goncharova (1812-1863), the future wife of the poet. Pushkin’s poems Madonna and It’s Time, My Friend, It’s Time were devoted to Natalia. 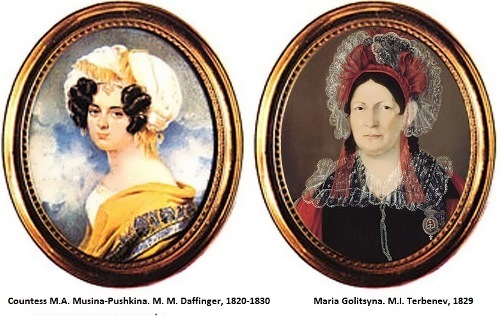 Maria – maybe Maria Nikolaevna Raevskaya (married Volkonskaya), Maria Eyhfeldt, Maria Borisova, Maria Suvorova (married Maria Arkadevna Golitsyna) or Maria Urusova (married Musina-Pushkina). Anna – probably Anna Wolf (1799-1857), eldest daughter of P. Osipova. The poems To The Birthday Girl and I Was A Witness Of Your Golden Spring were dedicated to her. Pushkin’s letters to her were published. According to another version – it was Anna Giray, who became a prototype of Zarema. 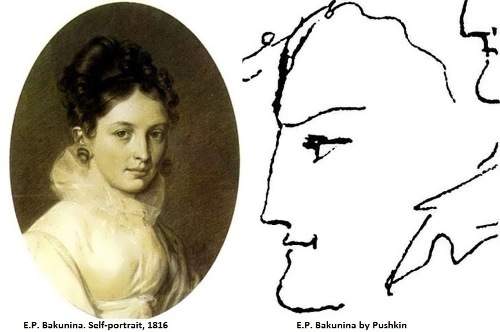 Sophia – Sophia Pushkina (1806-1862), a distant relative of Pushkin. 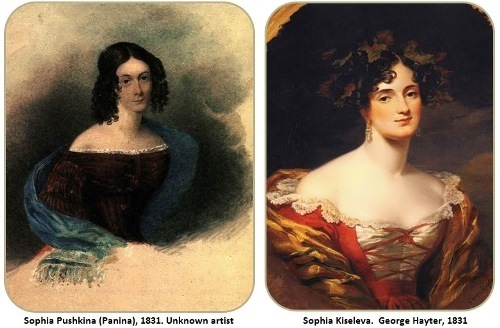 According to another version – Sofia Potockaya (married Kiseleva) or Sophia Urusova (married Radziwill). Alexandra – stepdaughter of P. Osipova, beloved of her son A. Wolf. The poem Recognition (I Love You, Though I Rage) was dedicated to her. Varvara – perhaps Varvara Cherkasheninova – Wolf’s close friend. Vera – probably Vyazemskaya Vera Fedorovna (1790-1876), born Princess Gagarina, wife of Pushkin’s friend P. Viazemsky. 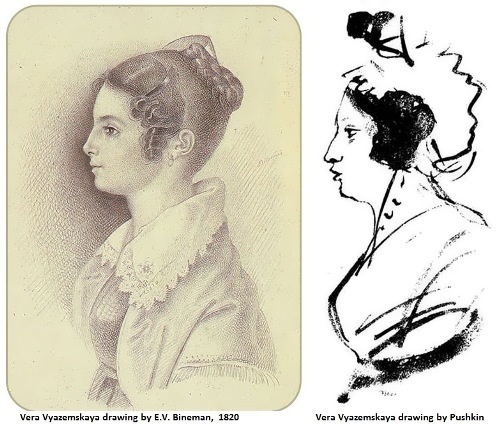 Pushkin met Vera in Odessa, where she arrived with two children in June 1824. Until the end of the poet’s life they remained friends. 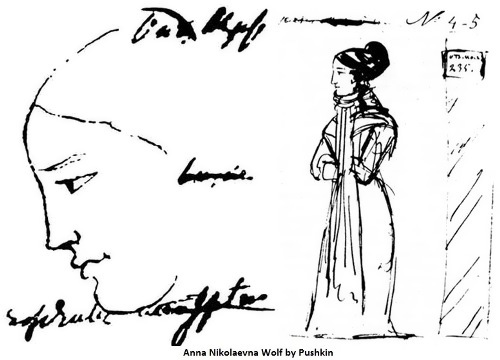 Anna – Anna Ivanovna Wolf (1801 – 1835), niece of P. Osipova. She met Pushkin in March 1825 in Trigorskoye. 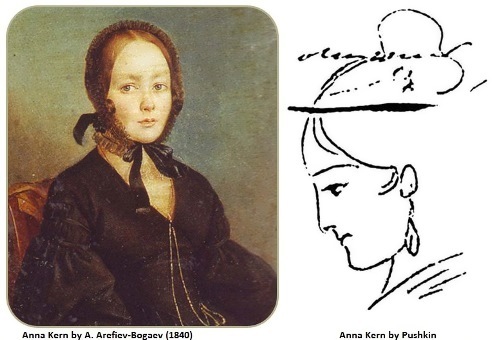 Anna – Anna Kern (1800-1879), born Poltoratskaya. 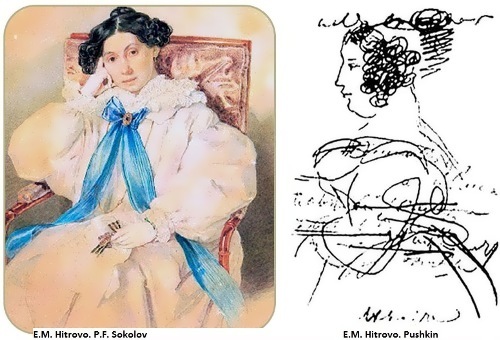 The most famous Pushkin’s love poem To *** (I Remember A Wonderful Moment) was devoted to her. Varvara – either Varvara Yermolayeva or Varvara Suvorova. 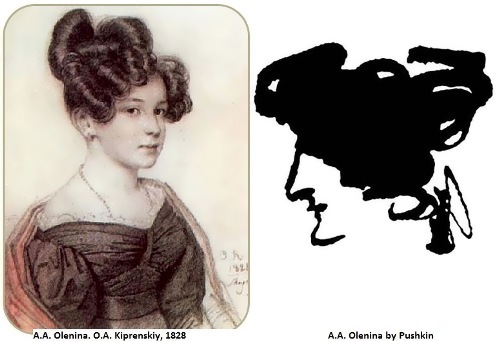 Maybe this name should be associated with a picture drawn by Pushkin in Ushakova’s album. Who was Varvara is unknown, but judging by her clothing, she could be the maid. 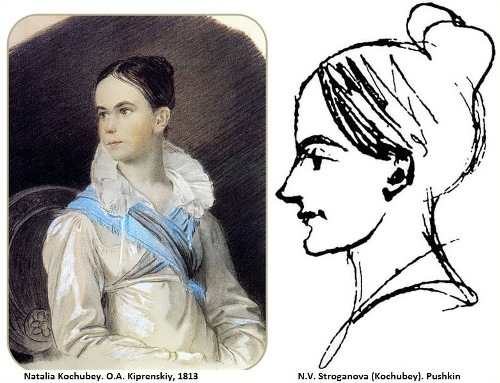 Elizabeth – most likely Elizabeth Hitrovo (1783-1839), born Golenishcheva-Kutuzova or Elizabeth Ksaverevna Vorontsova. Nadezhda – perhaps Nadezhda Sviatopolk-Chetvertinskaya. Agrafena – of course Agrafena Zakrevskaya (1799-1879), born Tolstaya. The poem Portrait (With Blazing Soul) was dedicated to her. Her image was reflected in Zinaida Volskaya in Egyptian Nights. Lyubov – perhaps Lyubov Suvorova. Olga – probably Olga Kalashnikova ,”Pushkin’s serf love” or Olga Naryshkina. Alexandra – probably Alexandra Rimskaya-Korsakova (Alina, Alexandrina) or Alexandra Smirnova – Rosset. 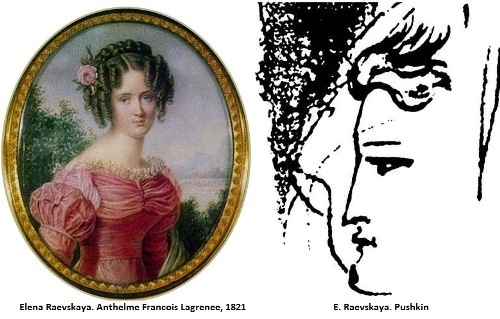 Elena – maybe Elena Raevskaya (1803-1852), Princess Elena Gorchakova (1794-1855) or Elena Fedorovna Solovkina. For one of the last two, I suppose, were written lines in Gabrieliad – I Saw Elena. 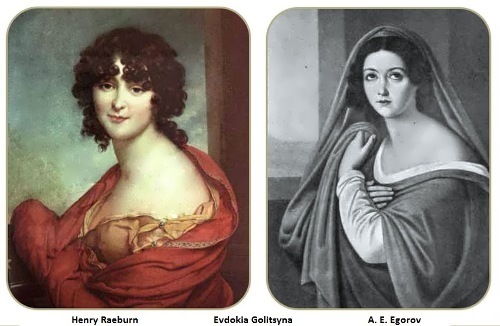 Elena – maybe she was unknown Elena or possibly Elena Zavadovskaya (Pushkin called her – Beauty Cleopatra of Neva). Tatiana – perhaps Tatiana Demyanova (1810-1876) – gypsy singer in the Moscow Gypsy choir. Avdotia – is unknown, but we can recall Evdokia (Avdotia) Istomina, romantic symbol of Russian ballet, the idol of the whole society of the first half of the nineteenth century. “In his poetry Pushkin paid rich tribute to literary Romanticism, especially in the first half of the twenties. He was sensual and yet reasonable, sometimes he was able to get involved in the madness, but never gave himself entirely. He confessed his love to many women, but in fact, liked only his muse” (P.K. Guber).